Parallel aggregate of rhombic, prismatic, glassy, bright, colorless crystals of armenite. 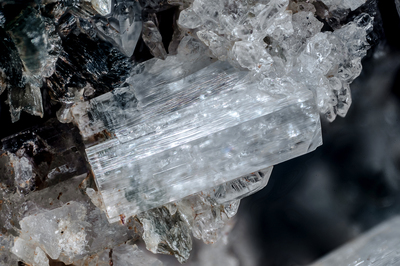 The green color comes from the underlying and above (top left) of thin green tabular crystals of a mineral belonging to the Chlorite Group and, both, associated with quartz. Collection and photo by Gianfranco Ciccolini. Nikon D750, bellows, Luminar 40 mm.